SELF wireless LED dimmer can be use for different LED lighting 12volt or 24volts constant voltage for LED kitchen lighting, LED strips and LED furniture lighting. This led dimmer unit has an operating frequency of 2.4 GHz. Equipped with a memory function: the light will return to the last setting before it turns off. With the included wireless LED dimmer you can operate the lighting up to 15 meters away. 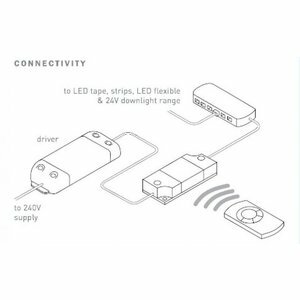 The dimmer receiver (unit) can be placed between the LED driver (not dimmable) and the dimming LED lighting. This one has a small size Lxwxh 78x40x16mm can easily be placed in a ceiling, soffit, cabinets or on the closet next to the LED driver. 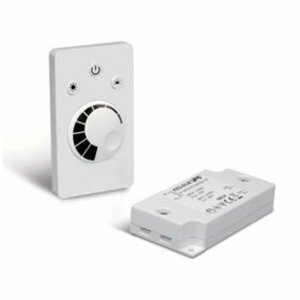 The remote dimmer has a small size Lxwxh 86x50x11mm with a hand you can hold and easy lighting control. With separate buttons for on/off, vollicht, dipped-beam headlamps and dial. A lithium cell battery CR2032 (3V) is also included so that you can immediately try it. A holder is also provided. This can be mounted on a wall so that your remote dimmer has a fixed place in a room. 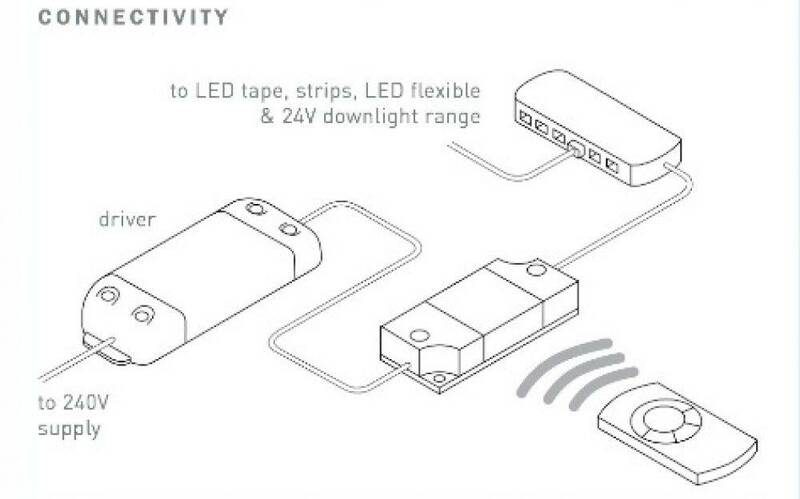 You can connect up to 15 watt LED spotlights for multiple 12 volt DC connection and 30 watts for 24 volt connection. Please note that the maximum watts rating of the LED spots may not exceed the maximum watts rating of the led driver. It is possible to send to multiple recipients with a remote led dimmer. On request we can supply these separately. 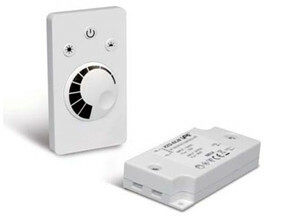 This LED wireless dimmer is suitable for LED lighting furniture in our range. For more technical details, you can view the attached document. We also advise you to carefully read the manual first before installing the devices! or let it install by a qualified technicians.